Night Train is a family owned company that started in 1981. Our goal is to create top quality luggage and sporting items that are both functional and durable at a reasonable price. Each piece is manufactured at our shop in Houston, Texas. All of our technicians have more than twelve years experience and are closely supervised. Night Train has over 100 pieces of luggage in our regular line. This does not include hundreds of custom items that we make for companies and individuals. We offer monogramming of names and initials on all luggage. 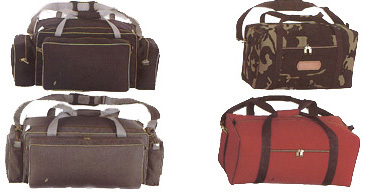 Also, our luggage is available in different color combinations to fit our customers needs. We use only materials of the highest quality to create a product that will be extremely durable. Night Train has sold over 180,000 items to over 20,000 satisfied customers. We are very proud of the fact that we have manufactured a top quality product since 1981. Our bags are completely constructed in-house to insure maximum quality control. All of our bags are made of tough, rip-stop 1000 Denier Cordura®. All items are manufacturered from the highest quality materials. Bags are easily cleaned by handwashing with mild soap and warm water. All Cordura® products are covered by Night Train's two year guarantee, and after that, we will repair (at cost) for the life of the bag. Our bags are priced substantially lower than similar bags on the market. Cordova® Colors: Navy, Smoke Black, Red, Wine, Royal Blue, Brown, Khaki, Hunter Green, Olive Drab, Camouflage, Purple, and Teal. Strap Colors: Black, Navy, Grey, Red, Brown, Wine, Purple and Teal. *Bags can be made with any combination of the above.